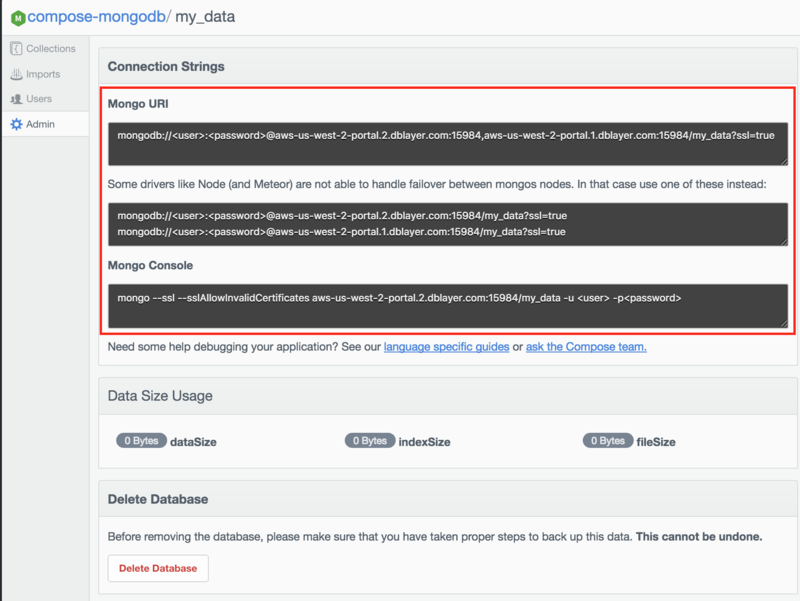 When importing or restoring your database into MongoDB, make sure that you don't use the admin database. Why? We'll show you. At Compose, our support team helps customers with a variety of issues related to their deployments. One issue that comes up frequently is related to errors that developers receive when importing or restoring documents inside a new MongoDB deployment and forgetting not to use the admin database. Whether you're familiar or not with the pitfalls of putting your data into admin, this article will show you some of the errors that you could run into, and show you the easiest way to solve this issue (hint: just don't use the admin database for your data). When creating a Compose MongoDB deployment, the database that is initially created is admin, which lives on different servers where your other databases will live. Although admin is shown as the initial database in the connection strings, it's important to realize that this is the database for administration. If you use the admin database directly you'll run into problems. The main purpose of this database is to store system collections and user authentication and authorization data, which includes the administrator and users' usernames, passwords, and roles. Access is limited to only to administrators, who have the ability to create, update, and delete users and assign roles. One of the major security risks of using the admin database is that all users who have access to it have the ability to create, read, update, and delete system users and databases in your deployment. While this can be limited by creating custom roles, it's far better to eliminate the risk altogether. If you manage administrators and users using the Compose console, you will only be able to create administrators within the admin database, and you can manage individual database owners through each database's administration console. In addition to the security risks, putting data into admin may lead to unforeseeable consequences that will lead to significant problems when importing or restoring data into MongoDB. Let's take a look at some of these problems and what we can do to avoid them. Although we tried to import the documents, we ran across error inserting documents: Writes to config servers must have batch size of 1, found 550. That's because config servers do not accept bulk writes. Even though it states that it has imported 550 documents, logging into the deployment will show you that in fact no data has been imported into admin. The solution to this problem is to swap out --db admin for a new database --db banks, which will be created automatically when the command is run. Additionally, since we don't have any users who are authorized to write data to the banks database, we'll have to use the --authenticationDatabase admin option that will allow us to log into our deployment and import the data using the administrator credentials. Now, logging into our deployment, we'll see that the database banks has been successfully created and contains 550 documents. If you've used mongodump to download your database into a dump file, you can restore your data along with users and their credentials into your new deployment. Sometimes, however, you may forget to swap out "admin" when copying and pasting your connection information. If you forget to change the database name, it can cause some unwanted problems. As MongoDB tries to restore the data, we run into the same error that we received when we tried to import the data earlier using mongoimport: error: Writes to config servers must have batch size of 1, found 550. So, again, MongoDB prevents us from bulk inserts, which will not restore any of our data or users into admin. The real problem comes when attempting to use the --drop flag when restoring your data using the admin database. In the previous examples, we saw some of the failures that MongoDB shows, but these don't have an effect on our database, except for the error we'll receive that will reject the data from being restored. When the restore includes the admin database, mongorestore with --drop removes all user credentials and replaces them with the users defined in the dump file. Therefore, what will happen is that all of our administrator credentials will be deleted. At the same time, our deployment will fail and we'll see the errors when we log into our deployment's console on Compose. At this point, you'll have to delete your MongoDB deployment from the console and create a new one since you won't be able to access your databases from the browser. As you may have noticed, we are using the --drop flag here. This will make sure that when creating newbanks we are dropping any collections in the database that might be in the target deployment and restoring all of the data and user credentials as a fresh copy. To avoid using the admin database, it's best to create databases that you can connect to which have their own users and roles assigned to them. To do this from the Compose console, click on the Browser link on the Overview view, then click the Add database button on the top right of the Browser view. After clicking on the button, fill in the field next to use with the name of a new database. In this instance, we will call it "my_data". Then click run to create the database. After the database has been created, we can create database users or collections. However, to get the connection strings for the database, we can click the Admin button on the database menu. This will provide us with the connection strings that we need to connect to our database with any application. As you can see, all of the connection information is the same as on the Overview view, except instead of admin as your database, you now have the connection strings using to your new database my_data. Adding users to the database is also done by clicking on the Users button on the menu. There we can click the button Add User. This will prompt us to add a new username and password for the database administrator, or dbOwner, who has administrative rights to the database. In this example, our user is "superman"
Once the user has been created by clicking Run, you will see that "superman" is now the owner of the new database. To assign readOnly privileges to users, you can create a user and click the readOnly button under the db.addUser command. We'll create the user "batman" who will only have readOnly access. This will give the new user "batman" only read privileges for this database, which is shown next to their name once he has been added to the database. In this article, we showed you some of the pitfalls of using admin, but we also showed you ways to rectify the most common problems you're likely to encounter. Just remember, when setting up a new Compose MongoDB deployment, be aware that when trying to import or restore data from an existing database, always make sure to not use the admin database. By keeping your deployment's users separate from the core data, you'll save yourself from some serious headaches that can be avoided.